Back in November, 2016, I posted an article focused on a magnificent documentary developed and produced by my mate Michael Valentine (click here to read that). 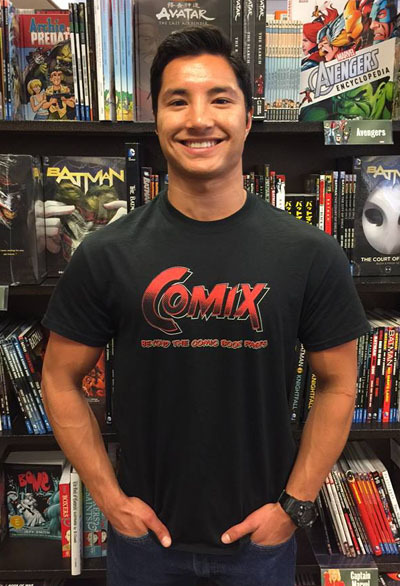 Michael's documentary is called, 'Comix: Beyond the Comic Book Pages', and in essence it recounts the media-centric phenomenon that has surrounded the comic book industry. More importantly, though, is that this 85 minute feature length film is told from the perspective of those in the know, such as the writers, artists, publishers, comic shop owners, and of course, the fans themselves. So if you want to be in with a chance of winning a copy, here, check this out! Now doesn't that look like a great film, true believers? Yes, of course it does, and thanks to Michael, you can now win it along with a Comix themed t-shirt (scope out the picture of the geek to see what that looks like). All you have to do to enter is follow the four simple instructions displayed below, but before you do that, please keep in mind that this documentary comprises a collection of the most engaging one-on-one interviews with some of the most iconic creators in the business. 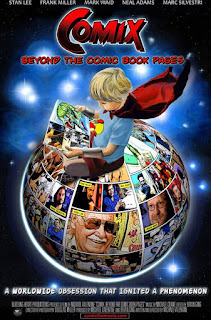 This includes interviews with people such as Frank Miller (The Dark Knight Returns), Neal Adams (Green Lantern / Green Arrow), Mark Waid (Kingdom Come), Stan Lee (Marvel), Mike Richardson (Founder of Dark Horse Productions), and Marc Silvestri (Artist and Founder of Top Cow Productions). Now have you got all that? Good, and good luck to you too. Furthermore, I best mention that you have to submit your entry by midnight, on the 25th of November, 2017, Eastern Standard Time, and that you have to be living in the United States to qualify. For more information please feel free to visit comixthemovie.com, or alternatively, email Michael direct on info@comixthemovie.com.